Workers and managers are blamed for the problem. 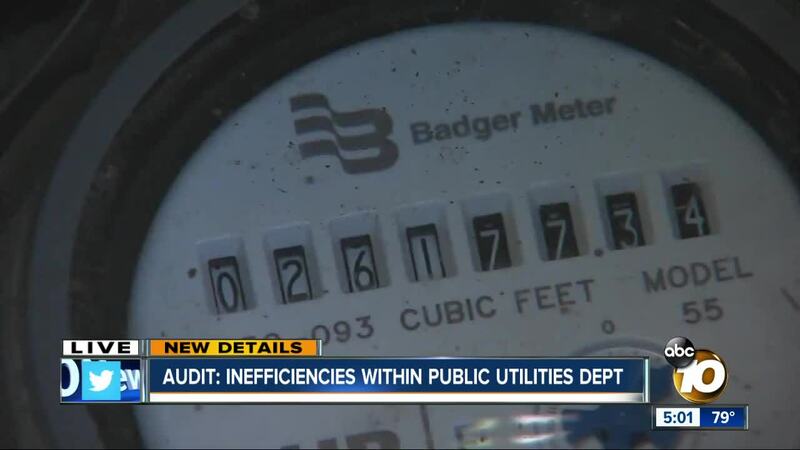 SAN DIEGO (KGTV) - An audit was released Friday that details inefficiencies and alleged work time mismanagement within the city of San Diego’s Public Utilities Department. The audit comes months after the City Auditor found that the Public Utilities Department sent erroneously high water bills to nearly 3,000 San Diego customers. Days before the release of the audit, Vic Bianes announced his retirement after serving as director of the Public Utilities Department. According to the audit, investigators found that 17 Public Utilities workers were putting eight hours worked on their time cards, even though they were actually working an average of 3.6 hours per day. The workers are part of a unit tasked with replacing faulty cement water meter covers and water meter boxes at homes and business across the city. The inflated time cards, according to the audit, were approved by supervisors. Employees in the Box and Lid Group had a work day that started at 6:30 a.m. and ended at 3 p.m. However the audit showed the crew's first service request of the day started at 9:36 a.m. and ended at 1:09 p.m. The workday also included time for employees to socialize in the morning before leaving the yard "as a way of promoting camaraderie", the supervisor reported to the auditors. Trips to repair box and lid issues were frequently wasted because "issues were not correctly diagnosed or sufficiently communicated (e.g. through the use of technology such as photos)", the report indicated. 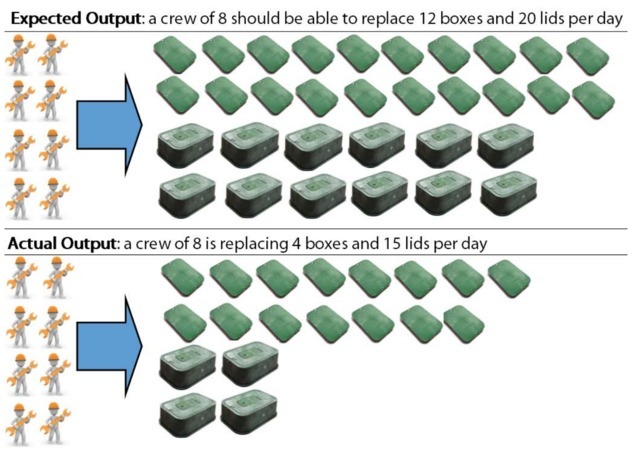 A chart included in the city audit demonstrated the amount of work crews should have been able to complete and what was done. It is unclear how much money was lost or what the workers were paid. Mayor Kevin Faulconer said the department needs to earn back the trust of its customers. "The Mayor has called for sweeping reforms that include looking into every aspect of the department’s operations and changing how things are done to better serve the public,” according to the statement. City Deputy Chief Operating Officer Johnnie Perkins said city officials are “appalled” by the audit’s findings. Perkins said of the issues in the report: “We own this. If there's an issue we're going to own it, and we're going to be held accountable because it's the ratepayers and the taxpayers of San Diego who we work for, and we cannot forget that."